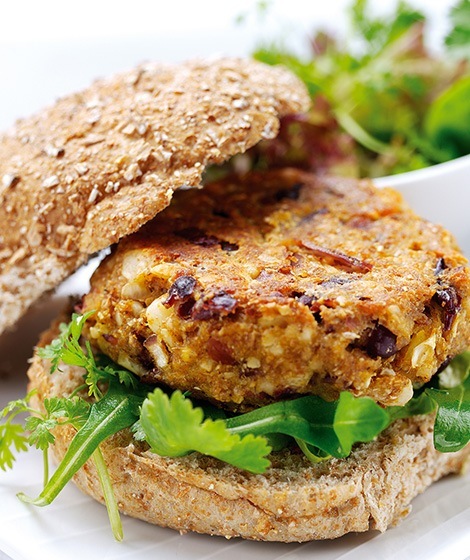 A great recipe for making your own spicy veggie burgers. Tip the beans into a bowl and lightly mash them against the side of the bowl with a fork until broken up but not completely mashed. Stir in the breadcrumbs. Blend the nuts in a food processor or blender until roughly chopped (or chop on a board by hand) and add to the bowl with the onion. Beat together the curry paste, ginger and eggs and add to the bowl with a little seasoning. Stir well until combined. Shape the mixture into four large or eight small balls and flatten into burger shapes. Heat half the oil in a non-stick frying pan and fry half the burgers for 4-5 minutes on each side until golden. Keep warm while cooking the remaining burgers in the rest of the oil. Serve the burgers in Whole Grain rolls with a refreshing salad accompaniment such as finely sliced tomatoes and red onion.